C&TCF Question #10: Other Movie Suggestions? lumineuse wrote: I'm used to be a huge fan of fantasy, probably because I fell in love with Tolkien at age 11, but I've never read LeGuin. Whose work would you compare her work to, Bohemian? Oh, you've got me there. I'm ashamed to admit I've never read Tolkien, so I can't offer that comparison. This may be a cop out, but this series (or cycle) has always stood alone for me. Beneath the tales of wizardry and great adventure lie the true quests for self knowledge and understanding of one's responsibility. How each choice affects others and the world we live in. Perhaps it shares that with Tolkien? There is an underlying calm and a strong sense of necessary balance. Yikes - not sure I am doing Ms. Leguin any favors here! I make it sound dull and heavy, but it is anything but. It takes me away to another world, simpler, yet the same. Simply magical. I hope you'll give the first book, A Wizard of Earthsea, a try. I know this may never happen but I can really visualise Johnny as Crowley in 'Good Omens'by Gaimon/Pratchett.Johnny as a fallen angel ,all in black-black shirt,tight black pants,black hat,black boots- sorry,getting carried away! !It would be a great movie to film,very Harry Potterish.Remember his fantastic car? Love it! Yes indeed he is. I wonder if he will do some more voice overs for animated movies? If I had enough imagination I could come up with one but I love anything by Dr. Seuss or maybe a Native American story? I can't think of any characters from kids books that I would like to see except those in the Dr. Seuss books. Green Eggs and Ham anyone? I know it's not a book but I would do SO MUCH to see The Wizard Of Oz with Johnny as the scarecrow. So much..
gilly wrote: I know this may never happen but I can really visualise Johnny as Crowley in 'Good Omens'by Gaimon/Pratchett.Johnny as a fallen angel ,all in black-black shirt,tight black pants,black hat,black boots- sorry,getting carried away! !It would be a great movie to film,very Harry Potterish.Remember his fantastic car? gilly, I haven't read Good Omens but other people have brought it up as a book they could Johnny doing as a movie. 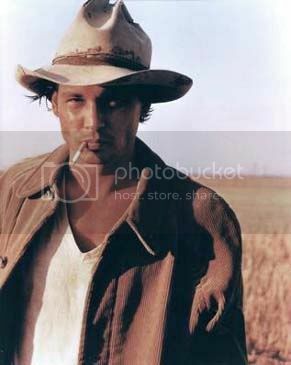 hisneverland wrote: I know it's not a book but I would do SO MUCH to see The Wizard Of Oz with Johnny as the scarecrow. So much.. Yes DITHOT. 'Good Omens'would have been fantastic.Terry Gilliam had high hopes,didn't he, of getting this made,but back in c1998,Johnny didnt have the so called Hollywood clout he has now..Wasn't the comment something like'Johnny Depp?Doesn't he do those European arthouse films? its been longer than I'd like to admit since I read Alice in Wonderland so do you guys think Johnny would be better as the Mad Hatter or the Cheshire Cat????!!!!! Oh YES gilly! I read that book a couple of months ago on recommendation from someone here at ONBC and pictured Johnny in that role the entire book....LOVED IT! The other book character that comes to mind is Ranger in the Janet Evanovich "Stephanie Plum" series....definately NOT a children's book though. But Ranger is very hot and Johnny would be perfect. Kind of a Sands character. I'm with you there, Bohemian. I love the trilogy. I love good fantasy writing that takes you into another world, while at the same time, saying something about human experience. I like the idea of Johnny playing Ged. If you liked that, might I recommend Philip Pullman's His Dark Materials trilogy? And lumineuse, this is what I would compare her work to. Good quality fantasy writing for teenage readers that has many layers of meaning. Two children lie at the heart of the books, so in that way it is similar to the Harry Potter books, but these are so much more rich and more original, I think. He quotes from Paradise Lost at the start, which is a bit of an indication of the depth. This is a quotation from a review of the first book, Northern Lights. "The story, with its spirited 12-year-old heroine Lyra, takes the classic form of a quest, and deals with colossal, often terrifying themes - one of which is the relationship between the body and the soul. An eye-widening fantasy, a scorching thriller and a thought-provoking reflection on the human condition." As you can see, some similarities with The Wizard of Earthsea. Personally, I prefer the second book, The Subtle Knife, to the first, when it switches attention at first to the second child, a boy, who kills a man at the start. It is even better. I think the books might interest Johnny, if only for the themes of light and dark and outsiders, but a part for him would be relatively small. Still, it wouldn't be the first time. I'd like to see him as the aeronaut in The Subtle Knife seies, but can't think of his name, the texan. Endora wrote: I'd like to see him as the aeronaut in The Subtle Knife seies, but can't think of his name, the texan. It's correct. I had to look him him up though. I'd forgotten him until I saw Endora's suggestion. Then when I looked, I just started chuckling, in recognition. Endora, I can definitely see him in that role! But I'd also like to see him as the shaman. oh I love the Chronicles of Narnia! Johnny would also do great playing the voice of the Lion...Aslan was it? "Everything here is eatable. I'm eatable, but that my children is called cannibalism and it is frowned upon in most societies." suec, for the Pulman recommendation! His series is sitting on my shelf, waiting its turn in my oh-so-long reading list. I'm always glad to find another Earthsea lover, and delighted that you've provided lumineuse (and me) with a comparable work.